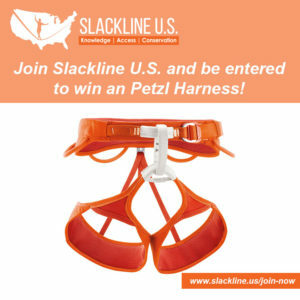 Join now – Slackline U.S.
Slackline U.S. members get access to big discounts with major brands including SmartWool, Hydroflask, Icebreaker, Deuter, Gregory, and now Mountain Hardwear, too! A single purchase at 30-70% off could pay for your membership! Sign up or sign into your account to find out how to access these discounts. We’re partnering with a major brand to offer $10,000 in grant funds for slackline projects that have a social or environmental impact. We’ll be posting more soon! Access is an issue for everyone. It starts with communication and knowing how to work with local officials and is maintained by consistent conservation and stewardship efforts. Slackline U.S. is tracking access issues around the country, building relationships with land managers, and having a lot of keeping our favorite areas open for slacklining. We do this largely by participating in conversations between slackliners and local officials, offering a wide range of publications on slacklining that can often be key in access negotiations. Additionally, we are collecting information about tree safety, the number of other cities/colleges/parks that allow slacklining, and accident data to show the relative safety of slacklining. Such information will enable better communication about the reality of slacklining as a sport. This aspect of Slackline U.S. is open to everyone regardless of membership, however membership fees will help support access development projects. We’re working with slackline festivals to help minimize impact on the land. For example, at GGBY in 2016, we kept 35 gallons of human waste out of the sensitive desert soil by supplying portable toilets in our first trial run helping in this capacity! We’re also funding cleanup day efforts at various slackline locations around the country. Contact us for more information. Have you checked out our Publications page? With help from the International Slackline Association, we’re producing and distributing fliers on everything from tree protection to longline rigging and sharing public spaces. Pingback: Highline Access and Anchors in America | Slackline U.S.
Pingback: SlackFlix & Chill – Community night in Portland, OR | Slackline U.S.